In order to succeed and proceed to higher management positions, combined expterise of technical know-how and economic knowledge is more often required. Experience with legal issues is an additionally sought after asset. This proofs that there is an increasing demand for employees with special knowledge in engineering, business management, marketing and jurisprudence. In the future, technicians, lawyers and managers will be specialists not only in their field of expertise but also the respective complementary ones. In areas where economists, lawyers and engineers work together on the same level, either at the top of small and medium sized companies or in units of big companies, a well qualified engineering manager provides expertise and solutions to bridge existing interfacial gaps. 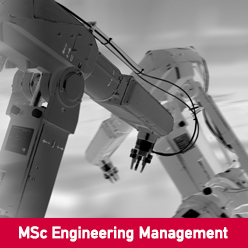 The MSc Engineering Management offers graduates from engineering schools the chance to extend and deepen their knowledge of economic and legal issues as well as it provides education in technical sciences for business managers and legal experts. This outstanding, international MSc Program pvodies you with the necessary knowledge fo an efficient and successful management of small and medium-sized enterprises or department of big corporations. This postrgraduate program is unique and tailor-made for the demands and needs of companies worldwide. persons with a basic knowledge of engineering who are already interacting between technology and economy or would like to do so. Visit the MSc Engineering Management page on the Vienna University of Technology website for more details!